Deb Gillman's recent column on multiple intelligences (Community Perspective, Jan. 16, 2002) got me to thinking about the differences I saw during my Peace Corps experience. One example hit me immediately as I typed her column. I remember sitting in the shade of a thatched-roof hut, hiding from the intense rays of the midday sun, reading a Dostoevsky novel. I had never been able to concentrate sufficiently on this classic of Russian literature to enjoy it in the hustle-bustle Western world, but in my more carefree days in PNG I was able to devour it. As I reflected on my new-found ability to read Russian literature, I looked up from the book to see my village father, sitting quietly on the porch with me. "He'll never be able to read this book," I remember thinking, basking in my grasp of Dostoevsky's dense prose. That vain observation was soon followed by a humbling one. As I sat reading that afternoon, my father was examining the jungle, watching the breeze, noticing the different trees, observing things that I would never be able to see. My verbal-linguistic intelligence (the ability to read Dostoevsky) was matched by his naturalist intelligence (his knowledge of the natural world). Moments of insight like this happened in numerous ways during my life in PNG. I was motivated to join the Peace Corps by a desire to travel, to live in a remote corner of the world, and to help the people of an undeveloped nation by teaching, but I found some of my rewards in very different ways than I expected. Teaching math was satisfying, in part because the abstract thinking required by mathematics was very difficult for Niuginians, who have such a strong sense of visual-spatial intelligence that even gods and spirits are considered to have physical forms in the real world. Heaven, it was once believed in parts of PNG, was reached by a ladder in Sydney, Australia. My desire to live in a remote corner of the world was spurred by a desire to travel and to have the time that life in the tropics affords. Having time to read, play guitar, write, and think contributed to my personal development in intrapersonal ways. I was surprised by my personal development in two ways. First, in contrast to my love of solitude, as I spent more time in PNG, especially at my high school, I became better and better involved with my students, my colleagues, and my neighbors. 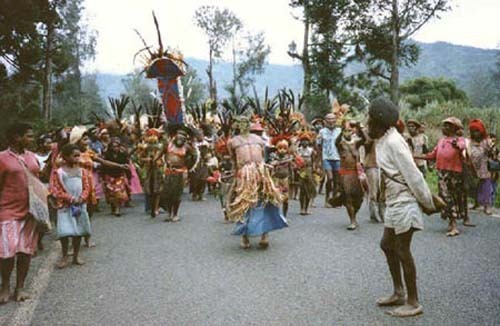 PNG is an interpersonal society, where family and personal relationships are preeminent and the basis of village life. I was not used to living in such an interdependent society, and my ability to share, of myself, of my possessions, grew tremendously during my time in PNG. Finally, while my diet was bland (mostly sweet potatoes, rice, greens, and whatever fruits and vegetables were available) it was incredibly healthy. With minimal health care facilities, I was the healthiest I've ever been. I got plenty of exercise, slept at least eight hours every night, and ate healthy foods. I still wasn't as fit as my village father, who though in his 50s rippled with muscle and looked like he lifted weights regularly. Niuginians don't need to go to the gym; they get their physical activity through daily life. For my village father, that meant cutting trees with a machete, plant-ing and tending a garden, cutting grass by hand, and other physical labor. For people at school, that meant being willing to wait hours for a ride in the school truck, while I, being freed from the tyranny of time demands, preferred to walk. While ostensively I lived in Papua New Guinea for 30 months to teach math, the most rewarding part for me was my personal development, which occurred in a variety of ways, and my learning about the different strengths of people too often dismissed as the poor and uneducated inhabitants of the Third World.